Sunday, August 2011. Summer has finally swept over us like a warm blanket. Waking earlier than usual, our sleep disturbed by a tumult of angst, a jumble of confusion, we felt the sun squeeze through the slats of the shutters and reach towards the bed, chasing away the discord of the night like a prayer chasing away the darkness and fear. We knew that today was the day to head outside of the city for a walk or a ride, a day to revel in the second coming of summer. After what has been a melancholy, dismal season, overnight the world has seemed to shift to right. We pulled out the bikes from the garage, loaded them into the car and headed out, deciding on a whim to pedal the Canal de la Martinière. This short 15-kilometer canal was constructed for commercial reasons in the late 19th century at a time when Nantes was a major port city. The passage from the Atlantic to Nantes was made, up until this time, by traveling the Loire River, but the Loire wasn’t always navigable nor reliable due to the seasons, tides and the constant build up of sand, and another access had to be built for the ships carrying products and goods. So a network of canals and basins was built to ease the passage of this transportation and create a waterway that was constant throughout the seasons. The canal, which would even afford access to large ships, saw an important and intense activity for about 20 years until, in 1913, technological progress allowed for a return to the Loire River for transport. The Canal became, until its re-use during WWII for naval purposes and followed by the German Occupation, simply a great boat cemetery. And finally, after a brief period of use by NATO in the Fifties, its uses were exhausted and the canal was no longer needed. Today, we ride up the now boat-free canal, her borders dotted with lone men or fathers and sons nestled companionably amongst the reeds, fishing poles reaching deep into the water. July in France finds the roadway that lines the canal unencumbered with Sunday strollers who are to be found here in the beautiful weather of June and September. These summer months only give us the occasional group of friends out for a bit of fresh air and men decked out from head to toe in professional biking gear like some odd, local leg of the Tour de France, men still working through the month until they can join their wives and children who are already out at the beach enjoying the long summer school vacation. Today’s ride is easy, almost languorous even though it is somewhat of a physical effort. We’ve never been a vacation family; you know, those who grab at each and every opportunity to pack suitcases, close up the house and head out of town to some beach spot, second home in the mountains, a fancy cruise or jazzy club. No skiing, boating or camping, no safari adventures or road trips to odd and unusual places. “School out”, unlike for most French families, does not mean bags and baggage and good-bye city, hello outdoors and sun. Nope. Neither JP nor I were raised that way. His family rarely went anywhere, the plight of true blue collar working families in those days. And my own father had only 2 weeks off every year and that meant visiting relatives, moving our family life to another home, either our grandparents’ or my aunt and uncles’. All those other weeks of school holiday were spent running in and out of the house, playing ball in the street or biking up to the public swimming pool. And time spent in the cool of the public library, reading to my heart’s content. Spending school holidays at home was a much-loved way of life. So, needless to say, fancy holiday spots or time away for the sake of “getting away from it all” are just not part of our culture. When the boys were small and we lived in Italy, we would place them on an airplane alone and pack them off to their grandparents’ in the French countryside for the month of July where the two of us would join them in August; JP and I would enjoy the calm of summertime Milan for one month as lovers rather than as parents, a time for ourselves. That’s not to say we didn’t have some fabulous family adventures: JP and Clem took month-long trekking holidays in both France and Morocco while Simon and I would head to the States; the four of us spent an incredible summer discovering New England, driving from the Poconos, up through New York all the way to Montreal, then back down again via Vermont, Connecticut and Long Island. Enchanting and memorable! We’ve traveled around Italy, thrilled to share culinary, historical and visual discoveries with our sons. We’ve visited New York City from top to bottom, from Brooklyn to Queens, the Bronx and Manhattan and loved every inch of it, every restaurant, monument, museum, zoo and park. Yes, we love to travel and are thrilled now that our boys want to travel and discover the world as well. But vacations are best spent at home, that quiet time when the city empties out, when the French abandon their homes, apartments, markets, restaurants and streets. For those of us living in France and sticking around, spending the soothing summer months in our own apartments, a kind of Zen-like sensation settles upon the city and it is a true pleasure to take walks through the streets, window shop and stop for an ice cream without having to push our way through crowds of students, parents with small children and strollers, gaggles of teens oblivious to the world around them. No traffic slows down our occasional excursion outside the city for a walk in the vineyards or forest on the rare sunny day. No noise breaks the calming silence as we sit in our livingroom and read, windows thrown open to catch the soft breeze, weather permitting. We gather up the courage for the occasional bike ride or picnic enjoying the empty space we are sure to find. The vacation spirit descends on our city and even those of us left behind find serenity and peace from the madness of the rest of the year. We have always wondered at the number of people who feel the obvious need to escape hearth, home and city every chance they can, every weekend, every school and work holiday. We have created a home that we love filled with books, kitchen paraphernalia, our music and films and we are absolutely content. Why leave, indeed? Summer, July 2018. This week, Chinon is unnaturally calm and quiet. Early morning’s flash storm has cooled the sultry, oppressive heat to comfortable. The hard work of running the hotel leaves me uninspired to do little more than kick back with my feet up and gorge on sweet summer fruit or, when I can, make jam. Gone are the days of family holidays and special events, no festivals to attend, no bustle of young people in our home; we run a hotel now, where others come for a break and we are always on duty. There are days like today, slow and languorous, when we stick close to home and I muster the energy to write or bake something, even as these days are little conducive to work and thought. We’ve had several mornings where 30, 35, even 40 guests eat their breakfasts and finish by 8:30, leaving us wrapped up by 9, and I’m done with my morning by 10 or 11. Other than check the rooms, I have the long afternoon stretching in front of me. Last weekend brought a visit from Simon and his friend Thomas and I baked his favorite chocolate cake for him. This weekend brings Clément and Olivia and her mother, and I should bake again, maybe something from my cookbook, something like the Navettes de Marseille and the Orange Financiers. My sons visiting are now the much-looked for and needed respite from our daily rhythm, almost as good as a walk in the vineyards or an impromptu bike ride along a canal. 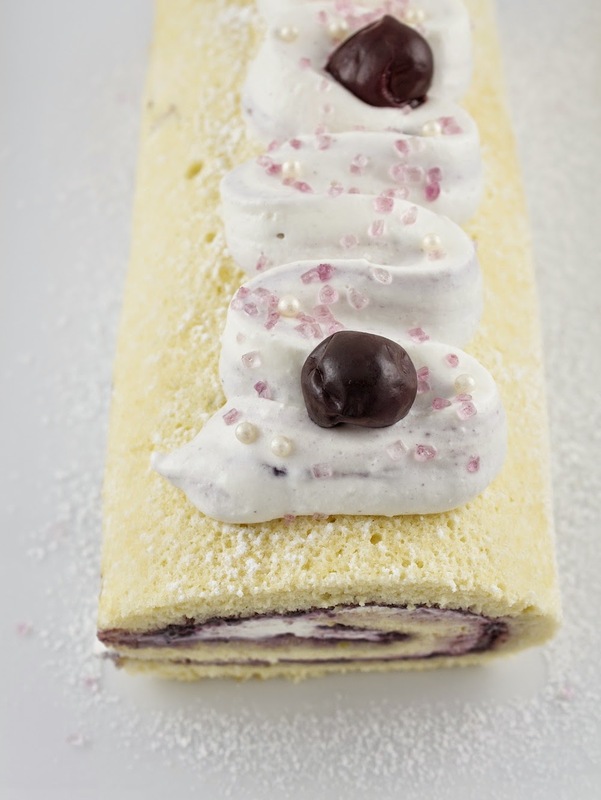 This summer season, a season of my favorite fruit jams, blackberry and blueberry, strawberry, black currant, and raspberry, demands a cake roll, light and satisfying, cool and refreshing with a thick whipped cream, flavorful with jam. I love making cake rolls, and often make one – a traditional French bûche de noël – every year for Christmas, like this Chocolate Chestnut Rum Christmas Bûche. But they are a great dessert any time of the year and an excellent treat for summer when served natural and light. This genoise is a great cake recipe, one that adapts to the form and any filling you like. A cake that is light, cool, and satisfying, made with a simple yet perfect genoise, a dense whipped cream filling, and your favorite jam. Place the 2 tablespoons cold water in a small saucepan; sprinkle the gelatin over the surface of the water and let sit for 5 minutes to soften. Place the pan over a very low heat to warm the water and melt the gelatin – you want to heat the water for about 4-5 minutes without allowing it to come to a boil or to boil away: allow the water to heat then, holding the pan just off of the flame/heat, swirling and whisking almost constantly, allow the bit of water to stay heated for long enough to allow the gelatin to melt. After 4 - 5 minutes, remove from the heat and allow to cool for 5 minutes or until barely tepid to the touch. Beat the heavy cream in a chilled bowl until thick, soft peaks hold. Continue beating as you pour the gelatin water into the heavy cream in a very slow stream. Beat in the mascarpone and the vanilla. Add and beat in enough powdered or icing sugar to taste; as the jelly or jam is sweet, I usually only very lightly sweeten the cream. If you like, you can also beat in a couple tablespoons of cream cheese or ricotta if you like a slightly cheesecake flavor. Place in the refrigerator to chill for at least an hour to overnight to allow the gelatin to add body to the filling. Line a 15-1/2 x 10-1/2 x ¾ inch (40 x 27 x 2 cm) jellyroll pan with parchment paper. Have a clean dishtowel larger than the jellyroll pan as well as a large, clean flat baking sheet ready. Separate the eggs, placing the yolks in large mixing bowl and the whites in a very clean medium-sized bowl (I prefer plastic). If you like, add a tiny pinch of salt and 2 drops lemon juice to the whites to help stabilize them. Add the sugar to the yolks and beat with an electric mixer on high until thick, creamy and pale, about 3 minutes. Beat in the vanilla. Using very clean beaters, beat the whites until peaks hold and the meringue is dense. Fold the whites into the yolk/sugar mixture gently but firmly using a spatula, a third of the whites at a time, alternating with the flour (preferably sifted into the bowl) in two or three additions. Do not over mix/fold but do make sure there are no more clumps of whites visible, no pockets of flour. Spread the batter evenly in the parchment-lined jellyroll pan and lightly smooth the top. Bake in the preheated oven for about 15 minutes or until puffed, golden and the cake springs back when lightly pressed. Remove from the oven. Immediately slide the parchment paper and cake together onto the second large flat baking sheet. Invert the warm jelly roll pan and place on top of the genoise and, holding both the jellyroll pan and the baking sheet firmly together, flip them over and remove the baking sheet; the top of the genoise is now face down while the parchment paper is up. Peel off the parchment paper. Dust a light layer of powdered sugar evenly over the genoise; place the clean dishtowel over the genoise. Once again place the clean baking sheet inverted on top of the dish towel-covered cake and, holding the baking sheet and the jelly roll pan firmly together, flip. Remove the jellyroll pan. You should now have the warm genoise topside up on the clean dishtowel on the clean flat baking sheet. Dust the top of the genoise evenly with a light layer of powder sugar and, starting on a short end of the cake, roll the genoise up – gently but as tightly as possible without crushing or breaking the cake - in the towel, rolling the towel up with the cake. Allow to cool completely. When the genoise is completely cool, carefully unroll it and slide the cake off of the dishtowel and onto a clean sheet of parchment paper or work surface. Spread the Mascarpone Whipped Cream evenly over the genoise; reserve about 3 or 4 tablespoons to use for piping a decorative swirl on the top of the roll, refrigerating until ready to serve the cake. Starting at the short end of the genoise (the end rolled up first in the towel to cool), roll up the cake as tightly as possible without pressing or rolling so tightly that the cream oozes out. When completely rolled, scrape off any filling that has oozed out. Using a sharp or serrated knife, cleanly trim off both ends of the roll (these can be eaten now). Very carefully, lift the cake roll onto the serving platter, placing the seam side down, remove the parchment paper and gently shape the log so it is even from one end to the other. Cover the cake and the platter with plastic wrap and refrigerate for several hours or overnight to allow the filling to firm up. Just before serving, dust the entire surface of the roll lightly and evenly with powdered/icing sugar, pipe the rest of the cream on top and decorate as you like with fruit, colored sugar or chocolate curls. 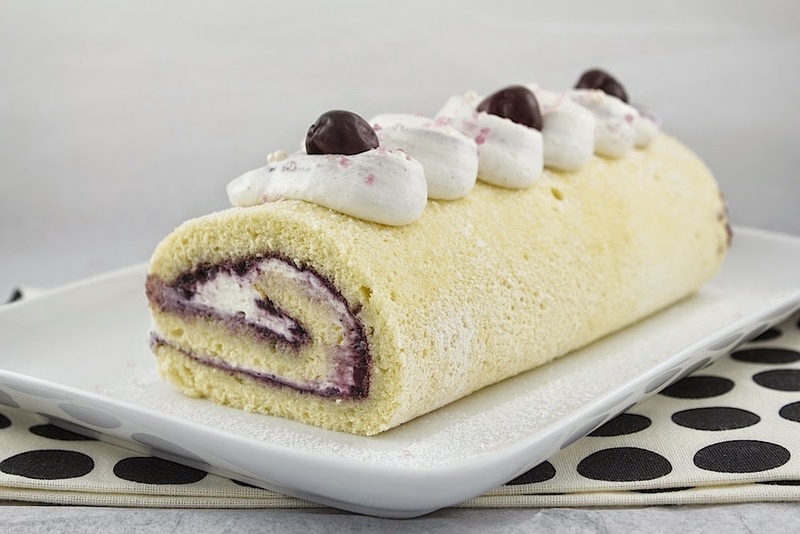 This is a magnificent genoise for any jellyroll cake any time of the year and so simple to make. Feel free to add finely grated dark chocolate to the Mascarpone Whipped Cream if you like. I recommend using a long-bladed serrated knife to slice the cake when serving. Love that Keen quote! It’s, well, keen. Anyway, we’ve gone years between taking vacations. Totally know how pleasurable it can be to stay in place. These days we do try to make a point of getting away somewhere. It’s always fun, but as much fun as the rest of the year staying home and doing things locally? I’m not so sure. 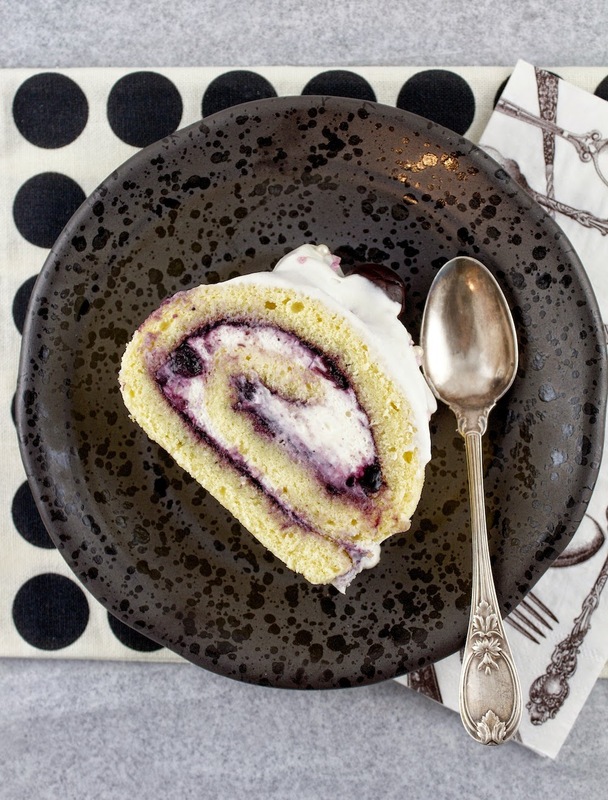 Anyway, always love the look of a jellyroll. Perfect dessert for you, too, with all the jam you make! Hi John! Yes, we’ve always loved staying home and enjoying our city more than we have time to do when we are working. Now that we work all the time, we still love wandering into town and sitting on one of the café terraces and observing. But we do love a getaway, too. Yes, I love finding ways to use jam!